Our Motel has finally been given the chance for some TLC this past winter, thanks to our hard working employees and supportful customers. Nearly all our rooms have been newly rennovated with installed laminate wood floors, every room has brand new beds, and updated bathrooms. Guaranteed a relaxing stay with us with our perfect blend of atmosphere, value, location, and service! The Meadows Valley Motel has 15 rooms. 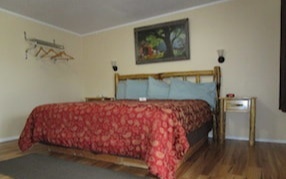 All rooms have a microwave, refrigerator, free wireless internet Cable TV, and A/C and Heat. Roadhouse Java opens early in the morning with offerings of gourmet coffees, exotic teas, Chai Tea, Ghiradelli hot chocolate and an assortment of locally baked goods. Don't forget to browse the creative gift shop full of local art, jewelry, candles, t-shirts and much more! We offer discounts only if the stay is at a 4-Night Minimum. No discounts offered on the weekend.